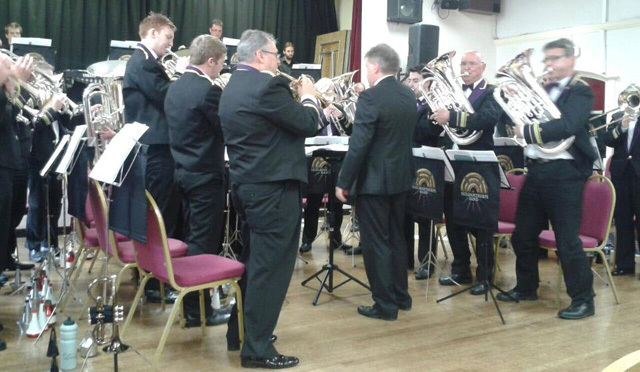 The Skelmanthorpe Band travelled to Derbyshire, to perform in the Creswell Social Centre charity concert. Funds raised by the concert went towards providing activities and training for people of all ages in the local and surrounding communities, through opportunities available in Limestone House, Creswell. Colliery disaster of 1950, where eighty miners lost their lives and many families in the village lost fathers, uncles and brothers. Julie Holling, the Chairman of the charity "Elmton and Creswell Village Company", welcomed the band back to Creswell and congratulated its Musical Director, John Roberts, on his choice of programme and the excellent standard of playing by the band members and its soloists: David Hirst on cornet, who played “Tico Tico”, made popular by Carmen Miranda in 1947; Mike Kilmartin on soprano cornet, who performed “On With The Motley” from the 1920 silent Italian drama film; Laura Brown on tenor horn, who bewitched the audience with her rendition of “Demelza”; and Steve Godson on bass trombone, who played “Killing Me Softly”, made popular by Roberta Flack back in 1973. Julie then paid tribute to the memory of the miners lost in the Creswell disaster and their families. The Skelmanthorpe Band paid its tribute, by performing “Nightfall in Camp” featuring ‘The Last Post’ played by the band’s Principal Cornet, David Hirst.